Sabrina Bryan Photos, News, and Videos | Just Jared Jr.
Is a Cheetah Girls reboot in the works? Adrienne Bailon is spilling! The singer and actress dished about reprising her role as Chanel, which she first made famous 16 years ago, in a new interview with ET. “We’ve heard the conversations from the fans, and that’s definitely something they want,” she told the outlet when asked about a reunion with her co-stars Sabrina Bryan, Raven-Symone, and Kiely Williams. 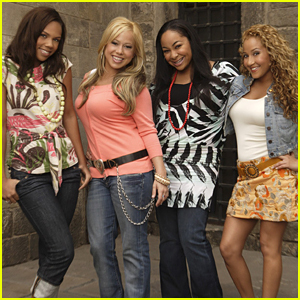 Cheetah Girls Kiely Williams & Sabrina Bryan Sing a Lullaby Version of 'Cheetah Sisters' On FaceTime! OMG! We are kind of freaking out over his mini Cheetah Girls reunion! Cheetahs Sabrina Bryan and Kiely Williams teamed up to sing a little bit of “Cheetah Sisters” for Kiely‘s baby daughter via FaceTime. “When your bestie @kielywilliams and her little one live so far away you have to get creative on how to spend time together! Lullabies for Baby Rowan! 💖 #cheetahgirls #besties #bestfriendsforever #lullaby #heartcoveredinglitter,” Sabrina captioned the video on Instagram. Kiely also shared another video of her singing part of the Cheetah Girls‘ song “Cinderella” solo to her little girl while breastfeeding. 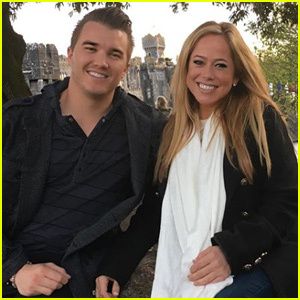 'Cheetah Girls' Star Sabrina Bryan Marries Longtime Love Jordan Lundberg! Sabrina Bryan has officially walked down the aisle! The 34-year-old Cheetah Girls alum tied the knot with longtime love Jordan Lundberg on Saturday (October 6) at Wayne Newton‘s home in Las Vegas. The couple chose the unique venue for the “romantic glamour-themed” outdoor event as Sabrina and Wayne became close after both appearing on Dancing with the Stars in 2012. Sabrina walked down the aisle in front of 160 guests in an intricately beaded custom fairytale ball gown by her “favorite designer” Hayley Paige before changing into a reception dress with a plunging neckline and a low back. “Jordan and I have dreamed about this day for a long time,” Sabrina told People. Sabrina and Jordan dated for almost six years before he proposed in April 2017. The couple plans to celebrate their honeymoon on a Mediterranean cruise. We can hardly believe that it’s actually been 15 years since Cheetah Girls made its’ debut on Disney Channel! Stars Adrienne Bailon, Sabrina Bryan, Raven-Symone and Kiely Williams all spoke with People to celebrate the film, remember the friendships that were born, and the importance of the movie. Raven also opened up about her instant connection with Belinda, who starred in Cheetah Girls 2; and Sabrina and Kiely revealed that their friendship that started on set is still going strong today. “Sabrina and I are still incredibly close, in fact, she was maid of honor at my wedding and this fall, I will be by her side as her matron of honor,” Kiely revealed. Ross Lynch wears a tight blue tank top while performing as Mark Anthony in the Hollywood Bowl production of A Chorus Line on Friday (July 29) in Hollywood. The Cheetah Girls‘ Sabrina Bryan also starred in the production as Val. Other stars included Mario Lopez and his wife Courtney, Smash‘s Krysta Rodriguez, and more. There are two more performances of the musical set for Saturday and Sunday night. Go see it! Ross Lynch & Sabrina Bryan Kick Off 'A Chorus Line' Rehearsals! Ross Lynch has officially started working on The Hollywood Bowl’s production of A Chorus Line with Sabrina Bryan! “First day at the Bowl!!! I’ll be snapping all day…I’m in heaven!!! #AChorusLine #HollywoodBowl @rossr5,” Sabrina captioned a WhoSay photo with Ross, which you can check out below. Ross stars as Marc Anthony in the production alongside Sabrina as Valerie Clark. A Chorus Line, the groundbreaking show about life as a dancer auditioning for a Broadway musical, will be directed and choreographed by Baayork Lee, who appeared as Connie Wong in the original Broadway production and choreographed the Broadway revival in 2006. The production will have three performances: Friday, July 29th, @8PM, Saturday, July 30th, @8PM and Sunday, July 31st, @ 7:30PM. Tickets are on-sale NOW!